Qilak, our 66’ custom blue water cruising design is coming together nicely at KM Yachtbuilders in Holland. Wiring and plumbing has for the most part now been completed and the internal aluminium structure sprayed with insulating foam. 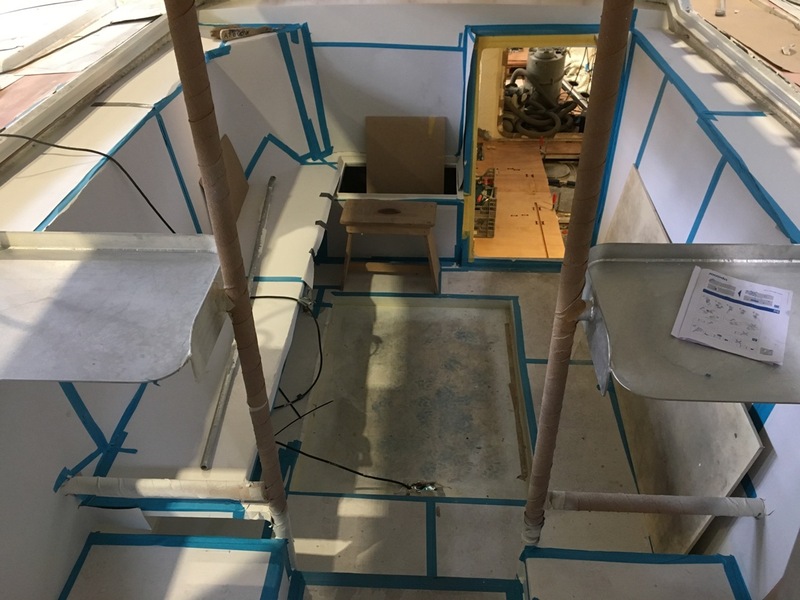 The deck and interior fit out is now underway, much of the interior having been pre-fabricated and mocked up already off the yacht. This is a true pilot house expedition yacht with all round windows that you can see out of when standing and sitting, internal helm/navigation area which can be seen in one of the attached photographs. The coachroof features a raked forward windscreen and watertight doors to the cockpit and main lower level accommodation areas. The owner considers this to be a weather tight threshold from the interior to the outside world and is a viewing/working area rather than a dedicated saloon (which is situated below in the main living area). The yacht is fitted with two very large Rocna anchors and 200m of chain which is stored some way aft of the bow. Four drum holders for large diameter mooring line for use in Fjords and in the ice can be found integrated into the mast area safety rails and the stern gantry. There is sufficient area on the foredeck to launch/retrieve up to two large rubber inflatables (stored deflated in the forepeak), while there is a permanent storage in a large transom garage for quick launch RIB. Launch is scheduled after the yard’s August holidays with sea trials taking place in the North Sea through September and October. Her first exploration into the ice will take place in northern water over the winter of 2018/2019, followed twelve months later with a trip south to the Antarctic Peninsula.